Often the first step in a transition is making the decision to change. 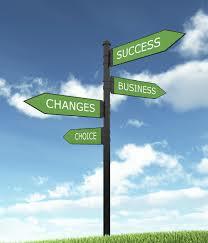 Change jobs, change your location, change your marital status, change your habits or change your behaviors. Have you decided to really make some changes? What is the decision I am struggling with? Am I ready to decide right now? If not, by when? What choice does my intuition tell me is the right one? How does that serve my values? Making a personal decision for life changes gives you an opportunity to re-calibrate your mindset and be open to learning. The process of examining possibilities, disturbing your stability and challenging yourself is the best way to actually start your transition. We can fall into traps – snap judgments, the easiest choice, and the one that keeps us in status quo – with only minor changes. Time spent gathering information is procrastination. The perfect time to make change is when you take baby steps to explore outside of your comfort zone. There is joy and discomfort in facing a new challenge. The need for change comes when you are feeling incomplete, bored or not connected. Those irritants stop you from moving forward. Transitions are about change and growth. Don’t be a prisoner to your own biases, self-interests and assumptions. Take the journey that will lead you to a new place. You don’t need to go alone. Most often, Transition Coaching sessions with Catharine Ecton Life Coaching focus on navigating a life change such as adjusting to a new geographical area, coping with a divorce, making a career change, moving past personal obstacles, adopting healthy habits or getting more engaged in life post-retirement. Sometimes, sessions address issues such as improving communication skills, conquering the tendency to procrastinate, and developing a more satisfying approach to life. Life Coaching with me will help you navigate these transitions and lead you to the choices that will be most fulfilling for you. Contact me today to schedule your first complimentary Life Coaching session via Skype or in person for those in the DC area. We will take the time to get to know each other, outline the issues you are facing and chart a course for our coaching relationship together. → Washington DC Life Coaching: How to Stop Making Excuses Now!